I have always said I needed to learn more about baking bread, and to learn more of Julia Child's recipes. When I found out that this month's Daring Baker's challenge, hosted by Mary (Breadchick) from The Sour Dough and Sara from I Like to Cook, was going to be Julia Child's French Bread, I was excited! And then I was disappointed. 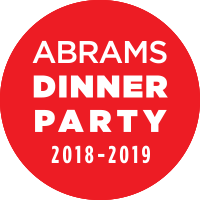 I knew this month would be crazy, and since I rarely make challenge recipes before the end of the month, and I would be in Rhode Island for an entire week including the last viable weekend, I was afraid I would have to back out of this one. Suddenly, yesterday, I was hit by a burst of insanity that is not infrequent in my baking inspirations (and I'm sure many of you can relate to me here) - if I started as soon as I got home around 4:30, I could wait out the entire 9 hour process and still post to my blog today! Call me crazy, call me delusional.... or just call me a Daring Baker! I took pictures of some of my process, but to be honest most of them were in my dark kitchen and just didn't turn out great. I had this great one of a huge gas bubble after the dough had risen a second time, but it is blurry. Imagine, if you will, this marvelous dough with only four ingredients - water, yeast, salt, and flour - going through the long process of being mixed, kneaded, rising, kneaded, rising, shaped, rising, slit, baked, sprayed with water, doused with steam from ice cubes I threw on the oven floor, and then reluctantly allowed to cool overnight. 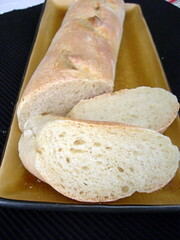 The recipe, which is at least ten pages long, can be found here on Breadchick's blog. As with most Julia Child recipes, you are very rarely left with a question as to what it is you are supposed to do. She is truly one of the great teachers in the culinary world. I did have some confusion over what folding lengthwise meant, but I just did what made the most sense. If you click on the link to the recipe, you can see Mary's illustrations of almost every step, and that will answer any questions you might have. There were two routes to take for the process of the recipe - hand or stand mixer. I have a Sunbeam mixer with a dough hook but always feel best mixing and kneading by hand - it is much easier for me to tell if the dough needs extra flour or water that way. This particular day, I added probably an extra 1/4-1/3 cup of water. There were many shape options for the bread - since this was my first time making the recipe, I picked the 3 batards, a slightly fatter and shorter baguette. I'd like to go back and try the recipe again with some of the other shape options. There were several options for baking the bread too - there were instructions on how to turn your oven into a baker's oven with quarry tiles, etc., but as I decided to do the challenge last minute I didn't hunt anything like this down. I did a version in between the two methods and sprayed the bread down every 3 minutes for the first half of baking, as well as throwing ice cubes into the bottom of the oven to add some steam. According to Julia, this extra moisture helps the outside develop a nice crust while also encouraging the yeast in its work a little while longer. I am grateful for this challenge. Even though the process took all day, the actual time spent with the dough was minimal. I really should try more bread recipes! 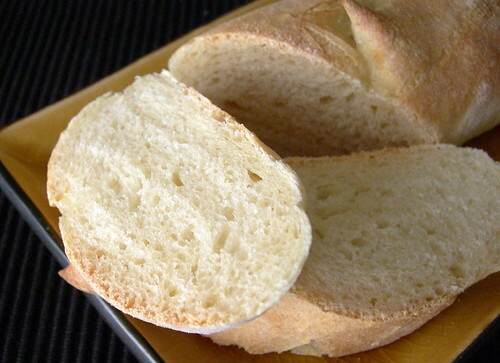 If you have a bread recipe that can't be missed, please post it in a comment! This recipe was brought to you by the Daring Bakers. 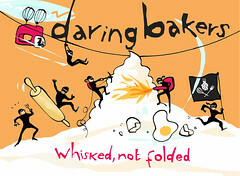 To see hundreds of other interpretations of this recipe, please visit the Daring Bakers Blogroll. To be clear, I did not make this. I spent the last week in Newport, RI, for theMusic Library Association annual conference. Being a music librarian is what you might call my day job. Newport was snowy and beautiful (you can see pictures from my trip here)! Most of the time when I travel, I like to visit a bakery and write a post reviewing their items, but anything that Newport has that wasn't a chain was closed for the off-season. I know there are some great bakeries in Providence but I was too busy to make it there, plus it snowed. This is the dessert we were served at our banquet at the Hyatt on Goat Island. A quahog is another name for a hard clam, and I loved how this dessert was created to look like one of the local clammy wonders. The almond-flavored shell was painted inside with chocolate and had a bunch of fresh fruit. 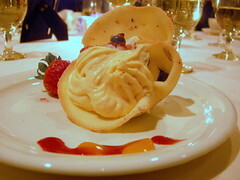 The cream was a mango mousse and whipped cream, with a blueberry serving as a sort of pearl. Wait, do clams have pearls? Maybe this was an oyster, but I loved the idea of it being a quahog, so I'll leave it at that. Obviously I have done no baking in the previous week, so I will simply let you gaze in awe at this masterpiece. Looks like I'm on a cupcake kick - well... kind of. This little coconut cupcake was part of a much bigger production. A friend of mine and I have been talking about having an afternoon tea for some time, but then I got sick, and then the second date we picked didn't have a good response rate. The third date was almost cancelled for other illness, but I'm glad we stuck with it! We had decided we wanted to do a white theme, but then white was a little too limiting, so we went with white and blue food. And by theme, I simply mean the food we made, not decor. Frankly, who needs decor with good looking food! 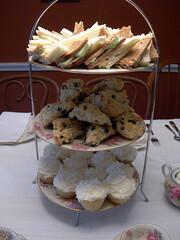 Other food included cucumber sandwiches, and blueberry scones. I used the buttermilk scone recipe from Baking with Julia and added dried blueberries (from Whole Foods, so the only sweetener was apple juice) and lemon zest. Cucumber sandwiches were simple - flavored cream cheese with cucumbers. I need to be honest and say that I feel uncreative with these and need to experiment with more interesting tea sandwiches, however these fit the color theme. 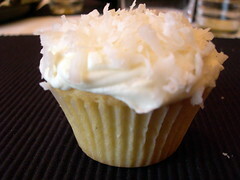 When you talk about coconut cupcakes, it would almost be blasphemy to make a recipe other than Ina Garten's famous one. This version is about a double batch of the one I made. The cupcakes were great right out of the oven, a little dry the next day when I served them, but I heard reports that they were terrific later on. I did cook them longer than instructed, so I'm sure that's my fault, but I didn't want to serve gooey cupcakes! 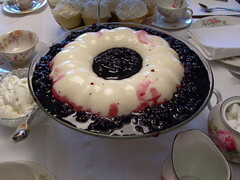 This was similar to couer d'creme, and with blueberry sauce, delicious! I had been waiting for an excuse to make these cream cheese penguins too, and they were so adorable! I am on my way to a conference, so will post recipes, etc., at a later time. Some people think using a cake mix is like cheating. There is also an idea out there that cakes made from cake mixes don't taste good. I disagree wholeheartedly with both! For many years I have been using recipes from The Cake Mix Doctor and Chocolate from the Cake Mix Doctor. The cakes are great, and the frostings are always superb. She isn't using the cakes as directed on the box, and the changes make all the difference. I think my favorite creation was using her double chocolate rum cake and using it as a basis for chocolate tiramisu - I should really post that recipe sometime. When finding a recipe for Valentines Day, my mind was on cupcakes for some reason, and red velvet cupcakes seemed fitting. This recipe comes from the Cake Mix Doctor website, so I will just point you there to make these for yourself. 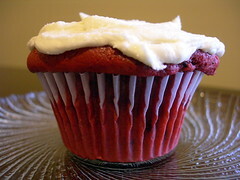 The batter is thick and a vivid red, thanks to the addition of sour cream and red food coloring; and the mini chocolate chips add a lot of interest and flavor. I'm not sure I'm a huge fan of the white chocolate in the cream cheese icing, but it does add an extra dimension of flavor. Some of them had pink sprinkles, lucky them! 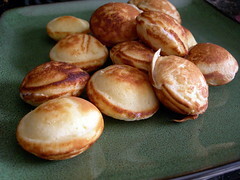 Actually, I do not know if the plural of ebleskiver is ebleskivers or not! For Christmas this year, I got a fun pan to make these little baby pancakes in. I'm a big fan of gadgetry despite my limited kitchen space - if I ever have a house of my own with a huge kitchen, I plan on needing an entire extra closet just for gadgets, and one for seasonal dishes. Anyway, ebleskivers are little pancakes that are cooked in a little pan with round holes, and you are instructed to turn them with toothpicks. I tried filling them the first time I made a batch but most of the filling ended up baking on the outside of the ebleskiver. The first time I made them, I also followed a more traditional recipe where you separate the eggs and it was good, but to be honest, the recipe that called for biscuit mix was just as good. And this time we had them with more leftover lemon curd, yet another good use of the deliciousness that came from the last Daring Bakers challenge. I'm not going to post a specific recipe here. I'm still trying them out, but wanted to share the fun of a new pan and a new breakfast treat! I have heard that the one that calls for ricotta is the best one, and I have not tried it yet. 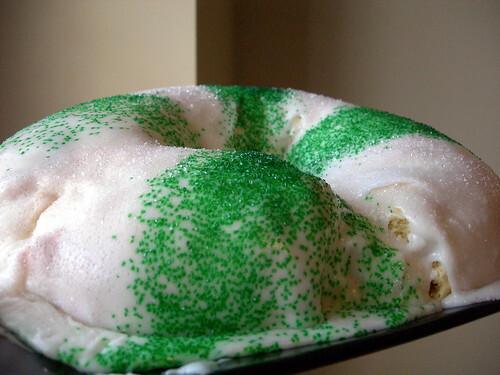 I have been wanting to make a king cake for a while now, and almost missed my chance again this year. After all, it is a sacrilege to make king cake before Twelfth Night or after Mardi Gras, and Mardi Gras Day is on Tuesday! So if it is too late for you, just file it away until next year. 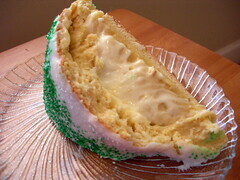 When looking for King Cake recipes, I found several versions. The biggest variation has to do with the filling. Ultimately, I had two deciding factors - I wanted one that looked reliable, and I wanted one that I could incorporate some of the lemon curd I still had left over from the last Daring Bakers challenge. The recipe I chose was from the culinary king of New Orleans - Emeril Lagasse. Combine the yeast and granulated sugar in the bowl of a stand mixer fitted with a dough hook. Add the melted butter and warm milk. Beat at low speed for 1 minute. With the mixer running, add the egg yolks, then beat for 1 minute at medium-low speed. Add the flour, salt, nutmeg, and lemon zest and beat until everything is incorporated. Increase the speed to high and beat until the dough pulls away from the sides of the bowl, forms a ball, and starts to climb up the dough hook. If the dough is uncooperative in coming together, add a bit of warm water (110 degrees), a tablespoon at a time, until it does. Make the icing. Combine the remaining 3 tablespoons milk, the lemon juice, and the remaining 3 cups confectioner's sugar in medium-size mixing bowl. Stir to blend well. With a rubber spatula, spread the icing evenly over the top of the cake. Sprinkle with the sugar crystals, alternating colors around the cake. King Cake is really more of a bread, and I had decided to make all Mardi Gras food for Super Bowl weekend. I started it the day before, and instead of letting it rise the last time, I stuck it in the fridge overnight. I had a slight confusion over how much cream cheese was 1 lb, but ended up using 2 8-oz packages. It seemed okay, if a bit excessive. I wish I had baked this longer. It was gooey underneath the filling, but the testers all came out clean. Now that the filling has set up more than it had in the picture of the slice, it is this fluffy delicious texture that is more mousselike than anything. I added probably 2 tbsp of lemon curd to the filling and it added welcomed flavor and depth to the entire cake. The topping was super super sweet, and just too much, even though I was eating a small slice with a strong cup of tea. Most times I would look at a pastry ring and express disbelief that it is supposed to feed 20-22 people, but you really don't want much more than a small slice of this decadent treat. I feel like I have let the traditionalists down by my colored sprinkle choices, but the store didn't have gold (power) or purple (justice), so I used green, which symbolizes faith during Mardi Gras, and pink, simply because, well, that is what I had.